Nine washing machines. That's how many I need to do our laundry; because that's how many we'll fill with what we usually accumulate, and why it takes me so long to do it, and why I dread it. OK, so maybe I don't need nine machines every time, but it's pretty damn close. We have so many clothes in the truck that I can go at least two weeks without having to wash anything. I have a bazillion pairs of undies and Ed has equally as many pairs of socks. Jeans I can wear two (or even three) days in a row depending on what I'm doing and Ed wears coveralls when he's doing anything but sitting behind the wheel. This way, he doesn't ruin a "good outfit" by strapping, chaining or tarping or doing any other kind of work on the truck. Maintaining a good appearance, with fresh clothing and good grooming, is essential for us out here. You never know who you might meet and first impressions are important. Looking good is a big part of feeling good and being treated well. My favorite line to hear, directed toward either one of us, is "You don't look like a truck driver." Probably the biggest contributor to the laundry bulk are sheets and towels; you'd think I robbed Bed, Bath and Beyond with all the sets I have. They take up a lot of room in the laundry bag. It's also one of the reasons I don't like to do my laundry at a truck stop; none of the machines are big enough. In addition to not having enough machines (when they even work), they never have the big, triple loaders. One laundromat we went to in Norfolk, Virginia, had a machine that could handle five loads. That was a dream laundromat. You'll never find that in a truckstop. So when I wash our comforter and blankets, I need those big machines. Last time I had laundry to do, I waited until we go thome, which was both good and bad. On the up side, I like it because the washer and dryer is right off the family room, which means I can sit in the lazy boy for hours on end and watch TV between loads. On the down side, it means I have to sit in the lazy boy for hours on end and watch TV between loads. Using a laundromat and being able to fill several machines at once, cuts my laundry time by more than half. Another reason I don't like to use the machines in the truckstops is because of the very fact that I have so much laundry. When I'm hogging all four machines, it means some other driver can't do his one load and get back on the road. Most guys I see carrying in their laundry only have a small bag. It's rare that I see one of them spread out over every machine in the place. It's convenient for them to do it right where they park, shower, eat and sleep. I don't want to get in their way. 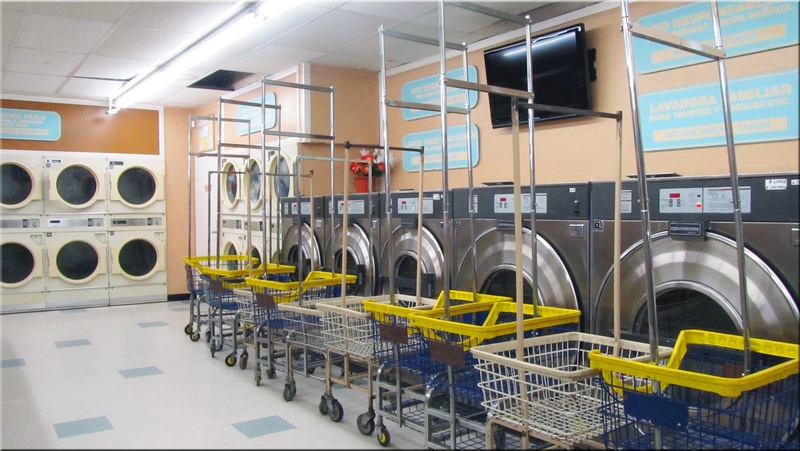 Finding a local laundromat isn't all that easy, and finding one with truck parking is next to impossible. I've always been good at getting into some pretty tight spots, thanks to my Grandfather's parking lessons, administered from the front seat of his giant 1970 Cadillac Coup Deville. In my young teenage eyes, that thing was as big then as our truck is to me today. It looked just like the car in this photo, with that loooong nose and those beautiful lines. The color was beautiful too, it was called Regency Gold Firemist. It was equipped with bench seats in the front, and a tremendous back seat. They were brown leather. My grandmother would use Lemon Pledge to "wax" the seats, which was a real treat for my brother and I, because whenever my grandfather went aroud turns, our little bodies would slide from one side of the car, allllll the way to the other side. When you're five years old, the trip across the back seat of a Cadillac is a long and exhilirating one. Did you notice how I said I'm good at getting INTO tight spots? Uh, yeah....I'm good with the in part, but I'm not always so great getting out. With the truck, that is. I always try, and sometimes I'm successful. And it usually happens in the middle of the night when Ed is sleeping, so I'm high-fiving myself all alone. But when I can't get out, when I'm in what some people might call "a pickle", that my friends, is where Eddie comes into play. Not only can he park in a thimble with his eyes closed, but he can get out of one too. When he does it, the trailer just seems to get all bendy and goes exactly where he puts it. When I try to get it to be all bendy, thinking I'll be able to maneuver it wherever I want, the reality doesn't always support the plan my mind hatched. But that's a story for another day, let's get back to the laundromat deal. Since we're not parking a Cadillac, finding a laundromat with truck parking is a challenge. I often use Google to locate local laundromats. You just put in the name of the town or the local zip code, along with the word "laundry" or "laundromat" and I can usually get a list of places in the area. It's not a complete list, but it's a good start. And where there's one laundromat, there are usually others nearby. Once I find one I like (and sometimes I do it just like I'd pick a horse - by an appealing name), I employ Google Earth to take a look at the place itself and the surrounding area. If I can park on the street, or in a lot nearby, I'm there. Try it out sometime. Some of the best I've found are the one in Norfolk, the 24-hour Miami, FL one and one in Lakewood, NY (which had tractor parking only - it's a VERY small place, but beautifully decorated...and there's a PHENOMENAL Wegman’s nearby). I've got all sorts of tips and tricks for how to do things in a truck off the beaten path. In fact, I can fill a whole chapter of a book with them. That last comment sounds like a very provocative book, can't wait to read it. I like laundromats with pool tables and a refreshments.